Fall weddings, in our opinion, are some of the best weddings, especially if you have your heart set on saying “I do” outside. The warm, vibrant colors of nature provide an absolutely stunning backdrop, and incorporating the natural elements in your ceremony and reception is incredibly easy and inexpensive. Pinterest is, by far, the greatest place to get inspired if you are looking for Fall wedding ideas. 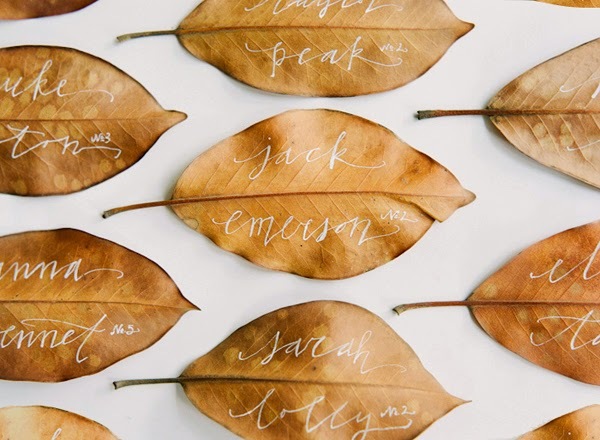 We scowered Pinterest and these are our favorite Fall wedding decorations. While the cooler Autumn weather is a blessing for brides, some guests might need to warm up. 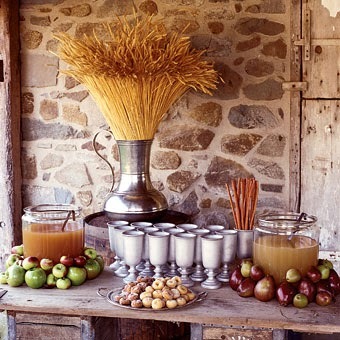 Set up a hot apple cider station for guests to assemble their own cozy beverage featuring one of Fall’s most fruitful staples to help take the chill off. For the most decedant cider, don’t forget to provide cinnamon sticks and pumpkin and sugar doughnuts! Simple and understated, a wheat bridesmaids bouquet is the ultimate rustic accessory for any wedding party ensemble. 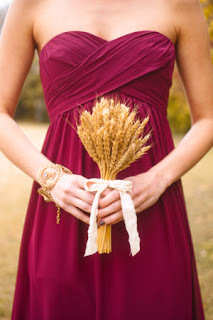 Incredibly easy to make, secure a thoughtfully arranged bunch of wheat with a ribbon that compliments the Fall wedding colors you have chosen as your pallette. These wheat bouquets are not only beautiful, but much more affordable than buying a flower bouquet for every bridesmaid in your wedding party. Beautifully simple and rustic, line the aisle with small tree stumps adorned with glass pillar candles and perfectly placed Autumn foliage. 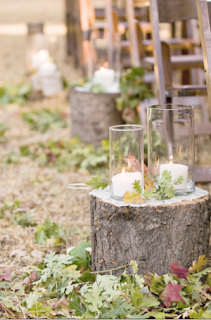 This idea will work wonderfully whether you exchange your vows in an outdoor or indoor ceremony as the tree stumps provide a flat, sturdy surface for you to create a romantic ambience with candles. 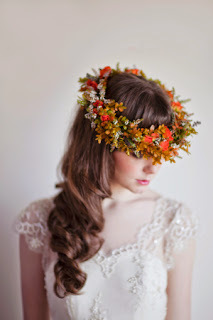 One of our favorite ideas we found, a rustic floral crown incorporates some of Fall’s most beautiful offerings in a head piece that is the epitomy of an Autumn bride. This is perfect if you aren’t crazy about the idea of wearing a traditional veil, and the best part is that you can choose from an abundance of seasonal foliage to create a crown that truly reflects you style and personality. 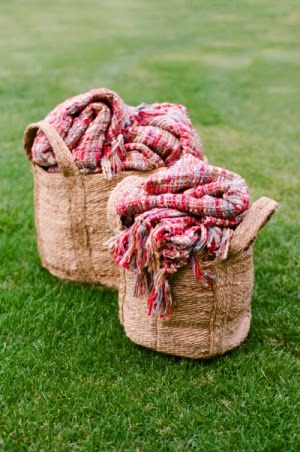 A must-have for any outdoor reception is to have wooden or natural-fiber baskets filled with cozy blankets scattered around. When the sun starts to set and the chillier air rolls in, guests can warm-up and be comfortable for as long as the party lasts. Instead of using traditional paper name cards, collect fallen folliage and paint your wedding guests names and table numbers on them. This is a truly unique and creative approach to seating guests, and the best part is that because the leaves are already dry, guests can take them home with them as a wedding momento that will last forever! 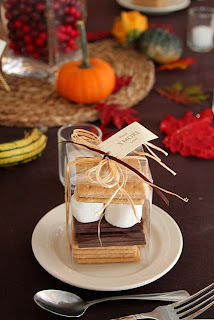 Assemble a smores making kit and place on the tables for a delicious Fall wedding favor! This is a particulary fantastic wedding favor idea if you’re going to have a fireplace or firepit at your recpetion. Even if there won’t be a fire for your guests to cook their smores over on your wedding day, they can take them home to make some day in the near future, and they will surely think of you and your sweetie when they are enjoying this tasty cold-weather treat!